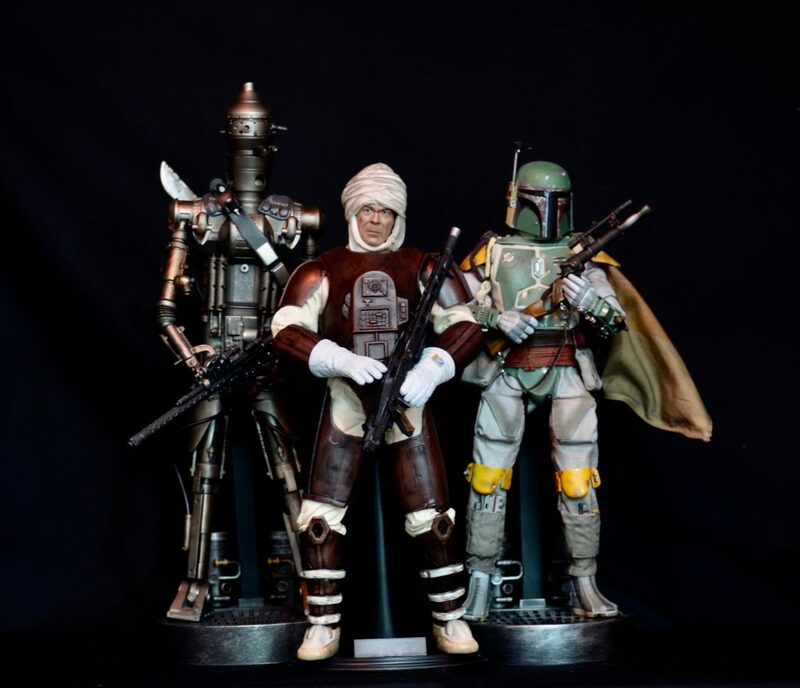 With Sideshow finally finishing the Empire Strikes Back bounty hunter series, many collectors had already broken out their old Hasbro figures to see what could be salvaged and upgraded with a little paint or some simple mods to display with their other figures. 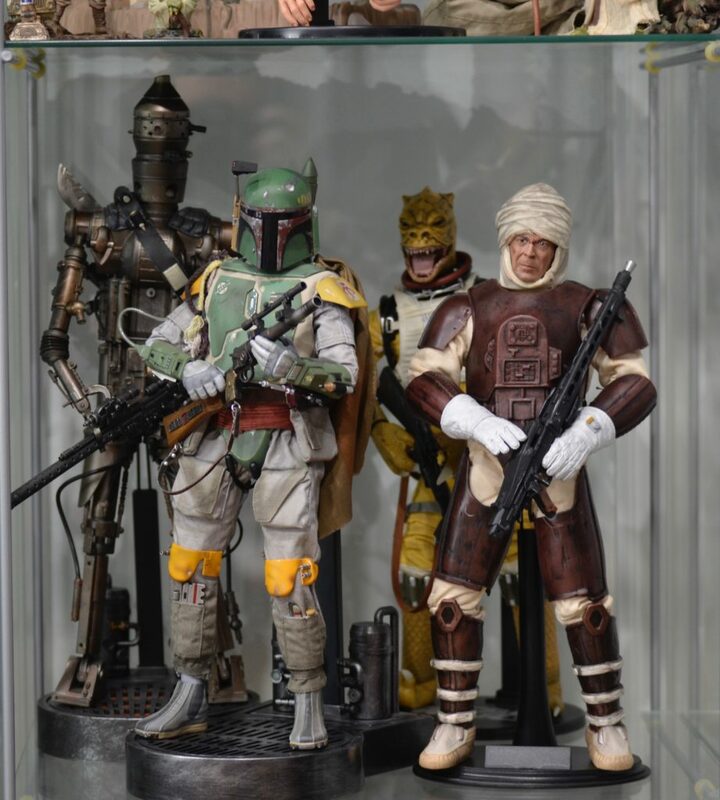 Curtis: After Sideshow released Dengar in 2017 for $239, I knew could make a display-worthy figure to put on my shelf. 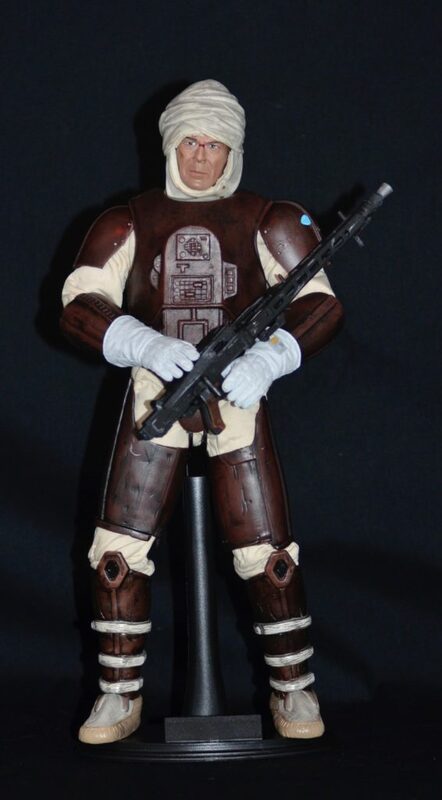 Dengar is not, after all, a very dynamically posed figure. Curtis: I started with the old 2002 Hasbro figure, thinking his armor could be used, and perhaps the head wraps if I could just give him a better face sculpt. Sideshow/Hot Toys armor is so expensive to part out so I figured a paint job and some weathering and I’m set. The base figure set me back $17. 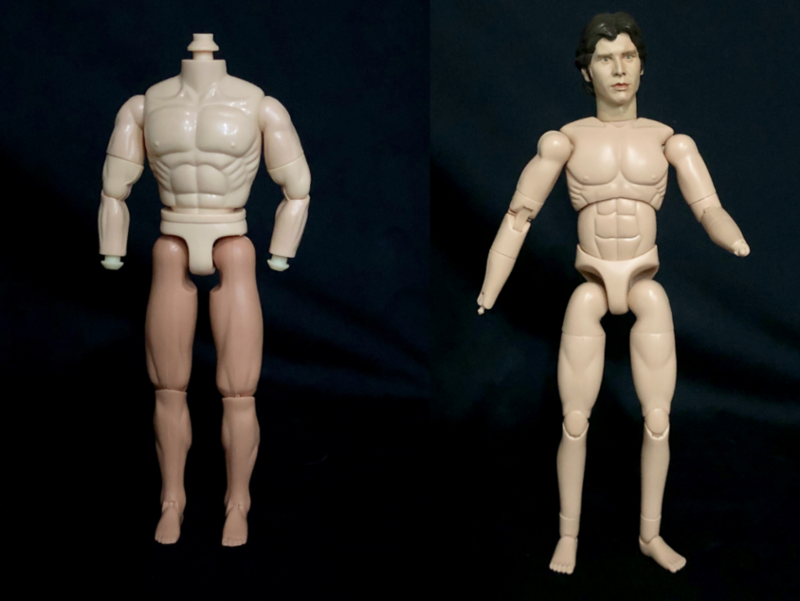 Curtis: For the body, I went with an extra Sideshow body from an older Han Solo figure. It has modern articulation and is compatible with extra hands and neck peg adapters to fit all types of heads. Plain bodies can be found online for $14-$20 if you don’t have an extra on hand. 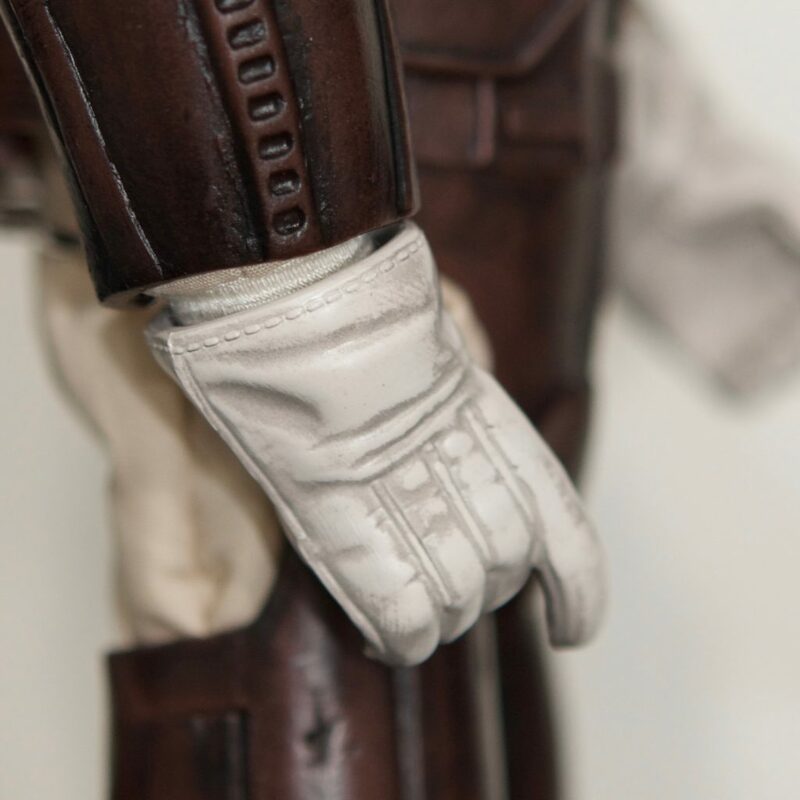 Curtis: Dengar has a “unique” glove shared by a bunch of on-screen characters that have not been made yet. 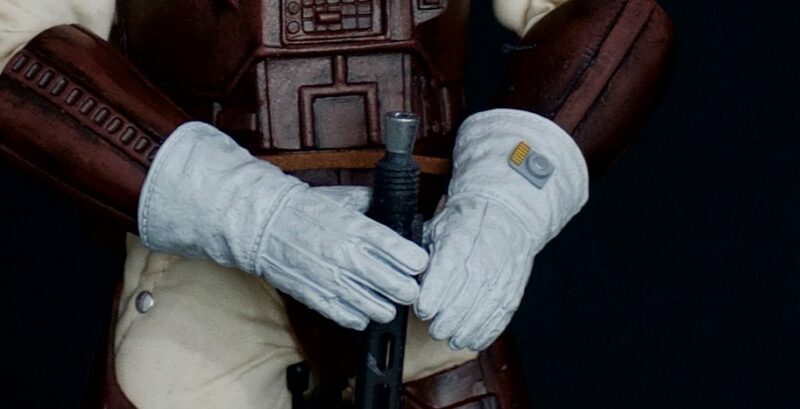 But very similar to the AT-AT driver glove and the AT-AT added some extra details I like. I found them for $7. Curtis: The trusty blaster for this bounty hunter changes in the film. 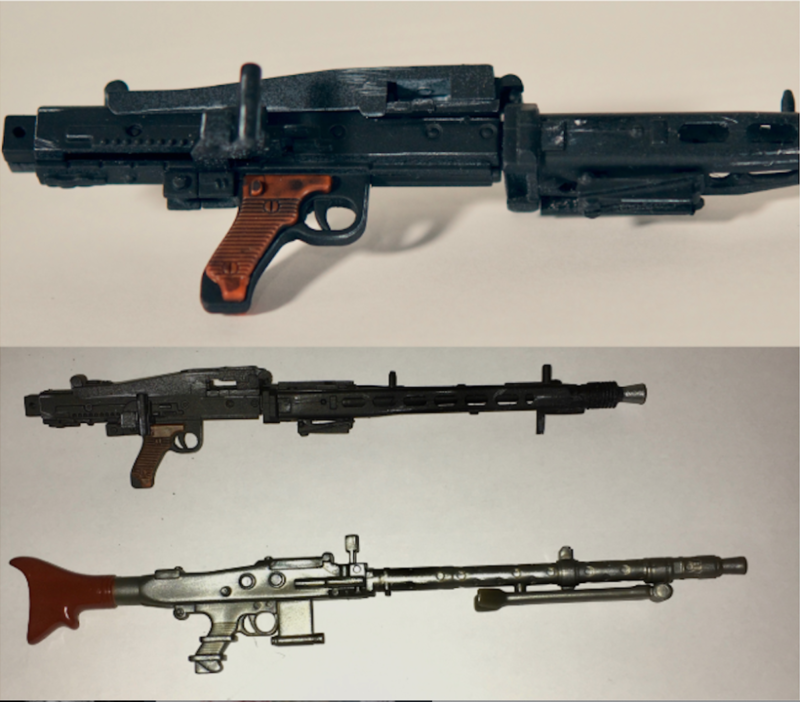 The base is an MG34 however of course in 1/6 scale that is not available and the few loose blasters form this figure sold very quickly online. However, an MG42 kit is online for $1-$2! I was able to score one on eBay for $0.76, a great deal to help build this figure on the cheap. It needed to be repainted and weathered. Simple black acrylic paint thinned with water to weather after simple black and silver paint. Curtis: For the jumpsuit, I did find a Tan/Green flight suit, online $5 and it arrived for this custom. After trying the suit on the body, it really didn’t look right. 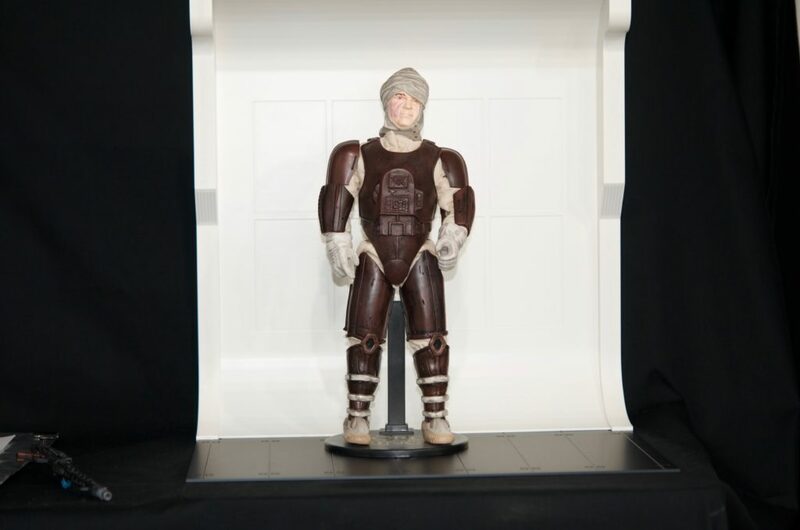 So I went back to the Hasbro tan Hasbro suit. For that was $5 ‘wasted’ but now I have a suit for another custom. 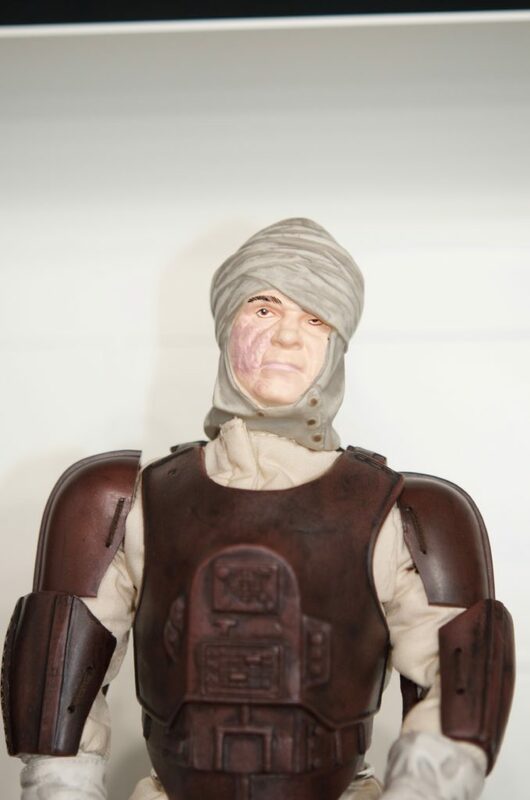 Curtis: Now, the worst part of the Hasbro (outside the stiff body) figure is the face. Using heat treatment or a warm hairdryer and a sharp knife I cut the face away from the head wraps. I had a few options for head wraps but figured I should save the Hasbro ones if I could. 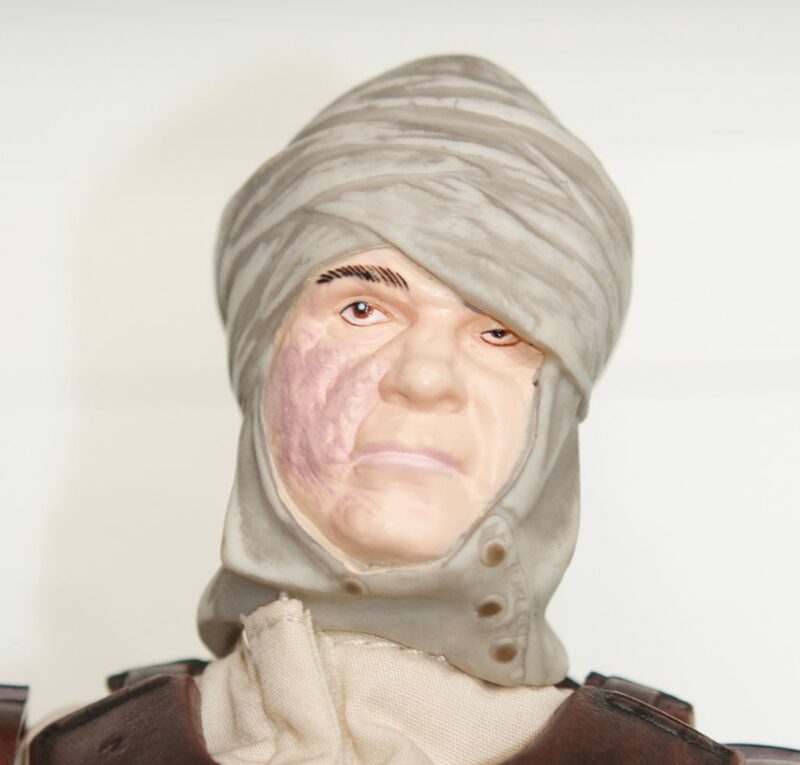 The original head is hollowed so that makes it a simple task of stuffing a new head in the wraps. 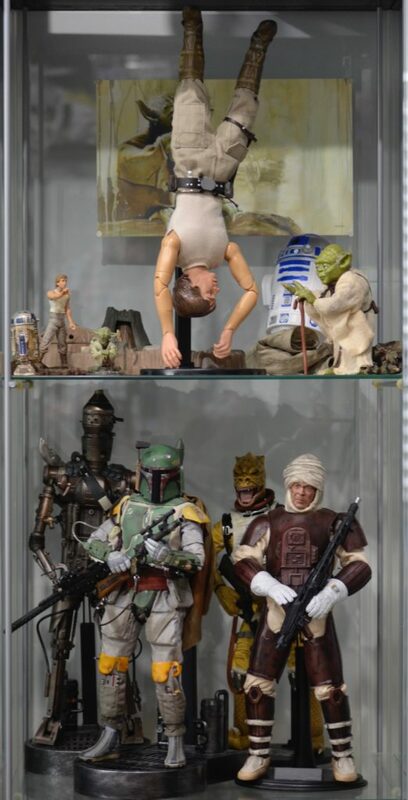 Curtis: The toughest part was to find a head with the quality to match my other Sideshow and Hot Toys figures on display. Online, you can find heads parted out from nearly any 1/6 figure released in the past few years. 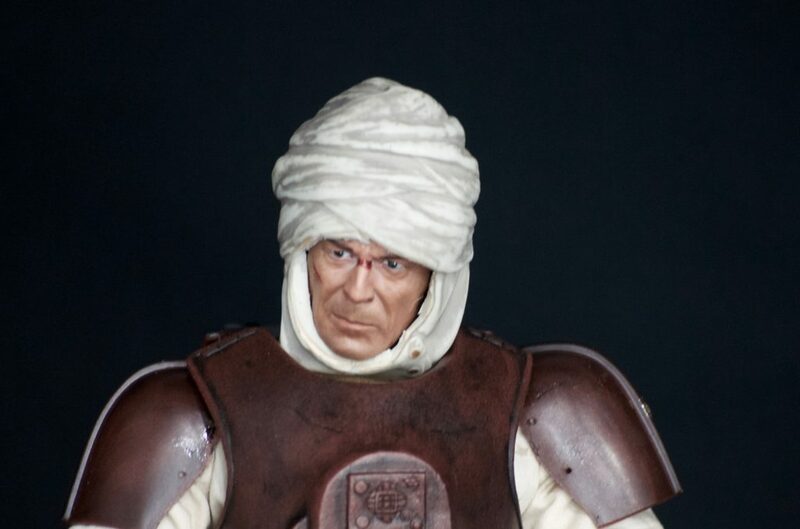 I found a “bloodied” head and thought that would look good under the head wraps and the lived in the universe of Star Wars. Curtis: Putting the figure together, I kept the Hasbro armor stock. I honestly did not think I could improve on the weathering and depth of colors in his armor. Not a big deal, again, this was going to be a 1/6 scale figure on the cheap and easy. Curtis: Sideshow’s figure looks good but the lack of dynamic display options made it hard for me to justify the $240+ purchase. So I attempted a good enough version. I know he’s not the best, and I do see areas for simple improvements, but for $66 I think it was a good start to building a custom figure. Perhaps I will keep finding low-cost Hot Toys/Sideshow armor to replace and upgrade, but for now, I am quite happy with him and moving on my next custom figure. I have also found a comparison between the Hasbro and Sideshow figure. 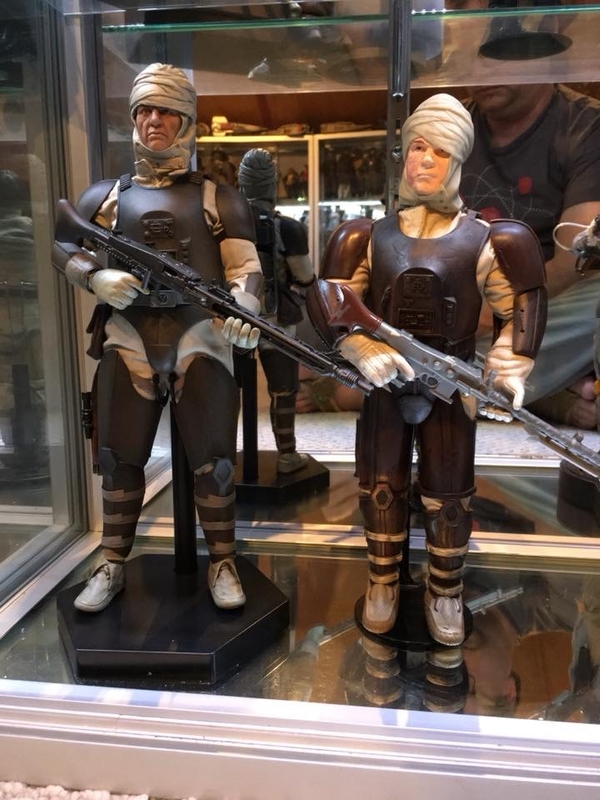 New stormtrooper legs/boots- Perhaps a future upgrade?